Conservatory construction really took off in the 70s, and during that time, the glass-panelled wonder quickly established itself as the best way to add value to a home. Unfortunately, conservatories are a notoriously difficult room to work with. They are sweltering hot in summer and bitterly cold in winter, and as a result, they often become a neglected part of the home. The first sign of damp often leads many homeowners to pull out all of the furniture, and suddenly the conservatory is little more than an ornate garden shed. If you want to avoid this fate for your conservatory space, there are a few steps you need to take before this often neglected room can become an idyllic space throughout the year. If you notice any areas of damp in your conservatory, it’s important to identify the source and tackle it quickly. If your damp is a result of condensation, you should check that air is able to circulate. Dehumidifiers can also help to remove excess moisture from the air. If the damp is caused by structural problems, you might need to ask a builder to check your conservatory. Damp can wreak havoc with your conservatory furniture, so it’s important to deal with this problem quickly. Your conservatory doesn’t have to be a secondary seating area, and many people find they use their space more frequently if they change the function of the room. 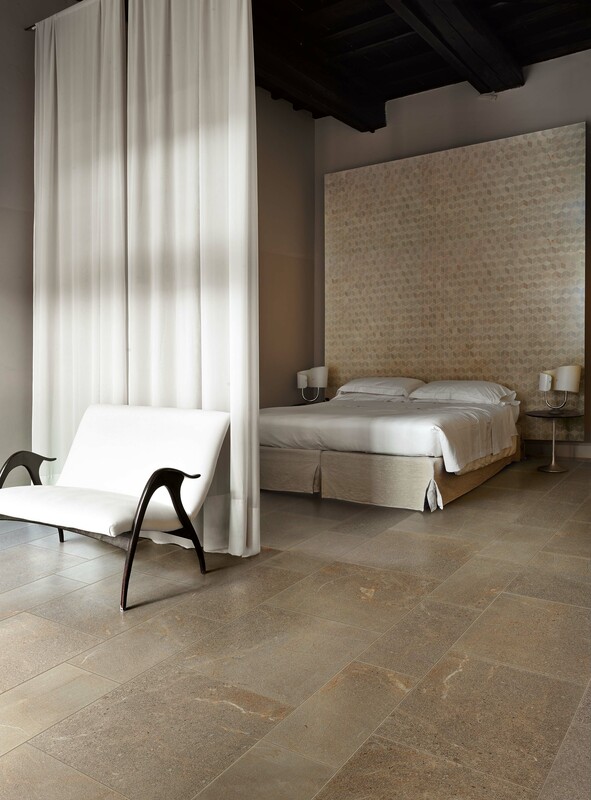 From home offices to spare bedrooms, the possibilities are endless. As it’s such a bright and airy space, it would also make an excellent home gym, a playroom for the kids, or cosy reading nook. Privacy is the biggest concern for many conservatory owners. Get rid of the net curtains that have been hanging for the past 40 years and invest in some stylish fitted window blinds. 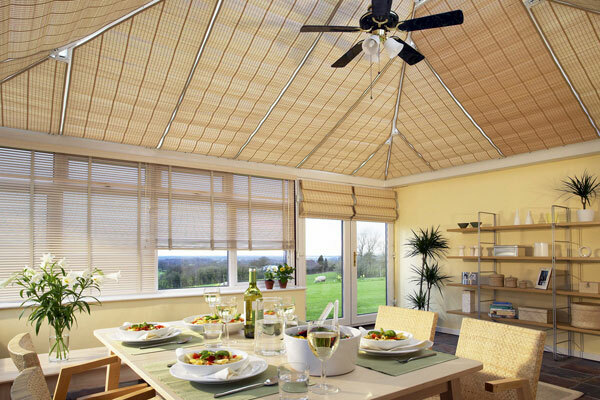 Birch roller blinds are perfect for creating a cool and calming environment like this idyllic dining room. Many modern blinds offer additional insulation and can help to regulate the temperature in your conservatory, so it’s worth looking for a custom solution. Adding personal touches and pops of personality is the best way to make your conservatory space feel cosy in winter and calming in summer. 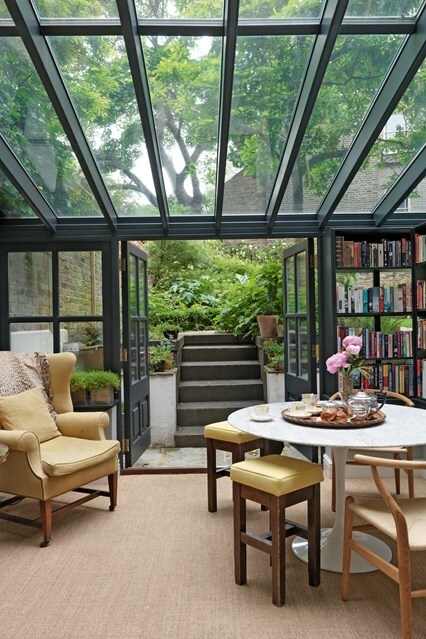 Bring the outdoors in with some potted plants, or turn the space into your personal library. In winter, layer up your furniture with cosy blankets and throws, and then introduce some scented candles for an atmospheric space that is perfect for relaxing in. In summer, take out the blankets and rugs and throw wide the doors to let the fresh air in.